I, for example, used to tell myself that the reason my marriage was failing was that my wife wasn’t doing X, Y, and/or Z or that the reason that my business wasn’t thriving is that nobody trained me correctly. Unfortunately, I got into the financial planning field at the end of 2008. If you were around then you know exactly what was going on. The market was tanking, the economy was diving, and I used that as an excuse for why my planning practice wasn’t doing well. Was it a reason? Sure. But definitely not an excuse. Gentleman, we’ve got to find a way to drop the victim mindset. But please don’t misunderstand me: there’s a huge difference between reaching out for help/assistance/guidance/direction and playing the victim. Today I’m going to talk about why I think men do this. We’re going to talk about the pitfalls of playing the victim card. Because, if you don’t think there’s anything wrong with it, you’re going to keep playing that card. Next, I’ll share with you five strategies you can use to avoid being a victim for the rest of your life. Before I get into all of that, I do need to describe what it is I’m talking about here. When I’m talking about being a victim, I’m talking about somebody who is absolutely helpless regarding the outcome of a particular event. Now, I realize we’ve all been there. We’ve been in situations that we can’t control, but I’d be willing to bet that the overwhelming majority of the circumstances in which we find ourselves are the circumstances in which we placed ourselves. Meaning, that those circumstances are the products of the actions, behaviors, and beliefs we’ve adhered to. As I talk about the “victim card,” I’m talking the mindset a lot of men seem to take on which is that there’s nothing they could do about a particular situation, nothing is their fault, nothing is their responsibility, and they’re blaming it on everybody else. That is the victim mentality. That is the victim mindset. With that said, let me share with you why I think this is. It’s important that we understand why a lot of us feel the way we do because if we don’t understand why we believe the way we do, it’s going be very difficult for us to grow. It’s easy to say that it’s somebody else’s fault. We don’t have to exert any level of energy, effort, responsibility, accountability when it isn’t our fault. We don’t have to apologize or rectify any situation. After all, if it wasn’t our fault then there’s nothing we can do about it. So, what do men typically do? They throw their hands up in the air, and say, “It wasn’t my fault. It was this person, this economy, this situation, but it had nothing to do with me.” People play the “victim card” because they’re lazy. They don’t want to exert themselves. They don’t want to accept responsibility. It’s significantly easier to say it’s somebody else’s fault. When you play the “victim card,” it does not damage your pride. All of us have pride. All of us have arrogance. All of us have egos. They’re so fragile that we’ll do whatever we can to defend and protect them. After all, when we say it’s our fault, that’s a blow to our ego. When we say it’s somebody else’s fault, that does nothing to damage us. We say, “Somebody else did it to me. There wasn’t anything else I could have done.” That salvages your ego. It’s misguided. It’s misdirected. It’s misplaced. But it certainly maintains that level of arrogance, pride, and ego. We’ve got to learn to let that go. You get attention (whether it’s deserved or not) when you say, “I was the victim. I was at the mercy of this event or that individual. This person was out to get me and that situation happened.” A lot of so-called victims love the attention they receive when they play the victim. It’s unfortunate because it’s very similar to the Boy Who Cried Wolf. Very quickly people begin to recognize who the victims are, and who the victims aren’t. Once they identify that, those people naturally gravitate away from the victim. 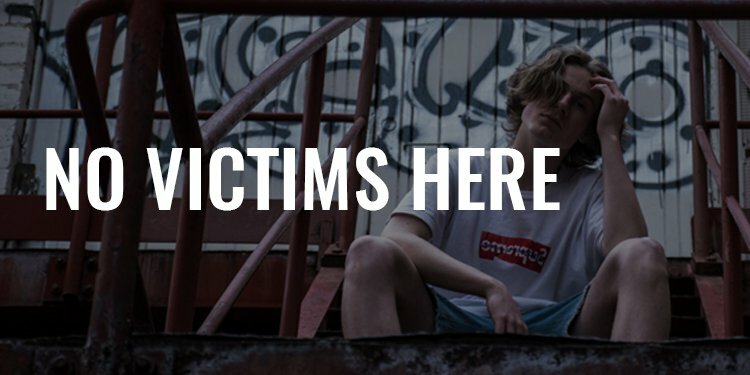 So, what do the victims do? They magnify their stories. They get a little bit louder. They get a little bit more sensationalized in their claims of victimhood. They seek more attention. Too many people want benefits without having to pay the price. They want the relationship without having to invest the time, energy, and resources into that relationship. They want the promotion without earning the promotion. They want the raise without earning the raise. They want the six-pack abs without having to wake up an hour early every morning and go to the gym for the next three, four, or five years. They want something for nothing. And, because they know they can’t have something for nothing, they start playing the “blame game.” After all, if something bad happened to them, maybe, just maybe somebody will feel bad enough for them and give them what they want without them having to earn it. If, for example, you make it your wife’s fault that your relationship fell apart, you have now subjected yourself to her. She has to change. She has to do something. The ball is in her court in order for you to maintain the relationship. If you’re complaining about how big of a jerk your boss is, and that’s the reason you didn’t get the promotion, then only your boss has the power to do something about it. There’s nothing you can do until, and if, he decides to change. If it’s the economy that you’re blaming your lack of financial abundance on, you’ll have to sit back and wait for the economy to rebound and improve. When you blame other people you put yourself at the mercy of outside factors, other people, and things that you frankly cannot control. If you continue to blame other people and outside circumstances, you’ll live a life less than you’re capable of. You’ll live in mediocrity. You could have the six pack abs but you refused to get into the gym. You could have the amazing, incredible, deep, connected relationship with your wife, if you’d only let go of the fact that maybe you have a large play in the relationship itself. You could have the business. You could have the promotions. You could have the wealth. Everything that you’ve ever wanted is at the end of accepting responsibility and accountability for your life. When you decide to play the victim, again, you’re subjecting yourself to other people, other circumstances, and you’re living a life less than you’re capable of. With that said, let’s talk about some ways to overcome being the victim. It’s becoming painfully obvious that the trend is increasing. There are more victims. More men want something for nothing. More men want it easy. More men fight too hard to maintain their arrogance and pride. More men want attention. More men are living in mediocrity and subjecting themselves to everything and everyone around them. You have got to vow right now to take ownership of your life. This is about accepting ownership and responsibility for every situation you find yourself in, even the ones outside of your control. Please understand that accepting responsibility does not mean you’re accepting fault. There are a lot of people who believe if you accept the responsibility that somehow you’re accepting the blame. Look, bad stuff happens. That’s reality. And, sometimes there’s not a thing that you can do about it. But if you accept responsibility for your own life and for the situation, you’re less likely to put yourself in those situations moving forward. Vow to take ownership. If you want a great book on the subject, read Extreme Ownership by Jocko Willink and Leif Babin. It’s a step-by-step guide for taking ownership, accountability, and responsibility in your life. You’ve got to do everything that you can to become completely self-reliant. You’ve got to get off the medications. You’ve got to get yourself out of debt. You’ve got to stop subjecting yourself to your boss, your wife, your employer, and your clients. You do this by developing the skills, talents, and abilities to take care of yourself. And, I’m not saying that you can’t accept help occasionally. That’s just as important as learning to deal with it on your own. And, in order to keep myself sovereign and self-reliant, I developed the skills, tools, abilities, and the strategies for making sure that I could pave my own way, that I could take care of myself, that I was anticipating potential threats and situations that may come up. One of the things that we do for example is food storage. I don’t want to be caught in a situation where we’re not able to get food, fuel, or power for any amount of time. I’ve anticipated that. I’ve prepared and planned up front so that if that happens, I’m self-reliant. Our family is reliant on ourselves, nothing and nobody else. Your ego is getting in the way of your success. Ryan Holiday wrote a great book on the subject called Ego is the Enemy. Your ego is destroying is your chances of success. Many people think it makes you stronger. They think that when they put up a barrier that they’re stronger for doing it. They’re not. They’re actually weaker – weaker because they can’t see the blind spots that present themselves. Since they refuse to look for the blind spots, they play dumb. They plead ignorance when something bad happens. Gentleman, drop the ego. It’s okay to ask for assistance. It’s okay that you don’t know everything about everything. It’s okay that you look a little foolish from time to time. It’s okay to even ask questions that you may not necessarily know the answer to. They only reason we don’t do those things is because we’re worried about the perception from other people and the way that other people think of us. It’s not a healthy way to live and it’s certainly not producing the results most of us are after. Ask yourself what lesson can be learned. In situations that you don’t have any control over, what lesson can be learned so that next time you avoid the situation you found yourself in? The more you look at life as a learning experience, the more lessons you learn, the smarter you get, the more capable you become of addressing those problems that will inevitably come up. And, if you don’t learn the lesson, you are bound to repeat it over, and over, and over again. This is why you see some people continue to do dumb things. They never really open themselves up to learning the lesson whether it was a skill or a mindset in order for that situation to be avoided next time. Ask yourself in negative situations what lesson can be learned? If you lost money, what lesson can be learned? If someone screwed you over, what lesson can be learned? If you go through a separation with your wife, what lesson can be learned? If somebody gets a promotion over you, what lesson can be learned? If one of your clients fires you, what lesson can be learned? It’s not the end of the world. It may seem like it, but it’s not. And if you don’t learn the lesson it’s going to keep happening over and over again. For those of you who spent time in the military or as a first responder, you’re probably familiar with what I’m talking about here. The After-Action Review is a process. It’s a very simple series of questions that you can ask yourself after every engagement, encounter, conversation, and project that will help you create a roadmap for growth moving forward. I ask myself five simple questions. I literally used to write these down, but now it’s so internalized that I can just ask myself now. What did I not accomplish? Gentlemen, do not fall prey to the victim mindset. When you do, you subject yourself to outside factors that you shouldn’t be subjecting yourself to and you live a life of mediocrity. If you’re reading this, you’re not interested in living a life of mediocrity. And, in order to elevate your standard of living, your fitness, your relationships, your business, your bank account, every element of your life, you are going to have to accept responsibility and ownership. You are going to have to become self-reliant in every way. You’re going to have to drop your ego. You’re going to have to ask yourself what lessons can be learned. And you’re going to have to incorporate an after-action review.